This edited article about birds’ nests originally appeared in Look and Learn issue number 800 published on 14th May 1977. Birds’ nests vary considerably, often to an amazing degree, in their shape, size and intricacy of construction. All these things, are, of course, governed to some degree as to where they are situated. 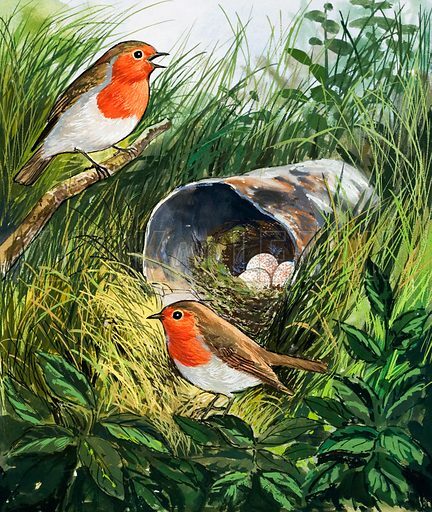 A nest is a shelter constructed by an animal for the purpose of rearing its young. The nesting instinct is common to a large part of the mammal world, but nest building has attained its highest development among the birds as a class. Generally, the most elaborate nests are made by those species whose young are most helpless in the earlier stages of life. Where, as in game birds, the young are still able to run about and pick up food soon after being hatched, the nest is on the ground. Birds such as the finches, which may have many enemies, take the most pains to conceal their young, either by placing them in an inaccessible place, or by covering the outside with lichens, or other material to match its surroundings. It is still difficult though to find a truly common factor when it comes to birds’ nests. Some make no nests at all, laying their eggs on bare ground or on a rock ledge. Others display a remarkable skill, weaving the most elaborate nests from grasses, or sewing large leaves together, using the beak as a needle, and bits of climbing plants as threads. Still others show great ingenuity in improvising nests under the most difficult circumstances. In some of the barren lands of New Mexico, where no trees or shrubs grow, crows have taken to collecting bits of wire, etc., left by telephone linesmen, and constructing their nests at the top of telegraph poles with these, much to the annoyance of repair men when this results in a short circuit. A few years ago a house sparrow in Regent’s Park was found to have made a nest entirely from matches and bits of matchboxes it had picked up in the park. Then there was the case of an Essex housewife who left a £1 in an empty milk bottle to pay the milkman. The next day the note had gone, but the milkman disclaimed all knowledge of it. This led to some embarrassment on both sides until some time later, when the housewife happened to look into a blackbird’s nest in her garden, where she found the note lining the nest and held in place with moss and grass. 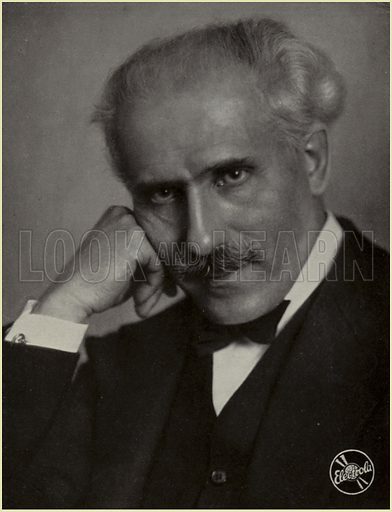 This edited article about Arturo Toscanini originally appeared in Look and Learn issue number 800 published on 14th May 1977. The ultimatum was delivered to the maestro on the evening of May 14, 1931 – almost nine years since Benito Mussolini and his Blackshirts had marched on Rome and seized political power. During that time liberty and free speech had been clamped down upon, and anyone who did or said anything against the Fascists was liable to be beaten up or arrested. But the bold Toscanini cared nothing for this. He declared that the anthem was “out” and that the “thugs and hooligans” could do their worst. Later that night, as he drove up to the concert hall in Bologna, his car was ringed by a shouting, jeering crowd. “Death to the traitor!” they cried as the conductor got out and tried to thrust his way through them. Some of the men had sticks and they beat Toscanini about the head and shoulders, knocking his famous, curly-brimmed hat to the ground. Others spat and kicked at him. Some merely waved their fists and shouted more abuse. Finally, unable to reach the hall, the conductor forced his way back to his car and angrily returned to his hotel. He was followed there by the mob, which stood beneath his window until well after midnight – shouting for his blood and brandishing clubs and spanners. As the hullabaloo continued so reports of it were wired to newspapers throughout the world. In the morning the Press was full of the “outrage”, and counter demonstrations were sparked off in cities from Turin to New York – everywhere where the maestro was loved and renowned as a superb conductor of operas and symphonies. In Milan, students gathered in the main square shouting. “Long live Toscanini!” and “Down with Fascism!” Symphony concerts were interrupted by protestors. Opera performances were brought to a halt as people stood up and booed and gesticulated. And then the great Russian-American conductor, Serge Koussevitsky, cancelled a series of concerts in Italy “until amends have been made to my colleague”. This edited article about Antoine Lavoisier originally appeared in Look and Learn issue number 800 published on 14th May 1977. The execution of Antoine Lavoisier was carried out on 8th May 1794. His crime was that, in reorganising agricultural methods, he had worked hand in hand with the landowners of the old regime. The revolutionaries were determined that everything connected with this should be swept away. Born in Paris on 26th August, 1743, Lavoisier grew up with the idea of becoming a scientist. While he was still a student, he won a prize for an essay on the best way to light the streets of his city. A greater triumph came in 1786, when he was appointed to the post of Chemical Assistant to the French Academy. This meant that he could devote all his time to research in chemistry and physics. Lavoisier gave the name “oxygen” to a gas that particularly interested him, and carried out many experiments concerning the behaviour of gases. Probably most important of all, he founded the modern theory of chemical elements. He was given the job of organising public health and improving methods of agriculture. 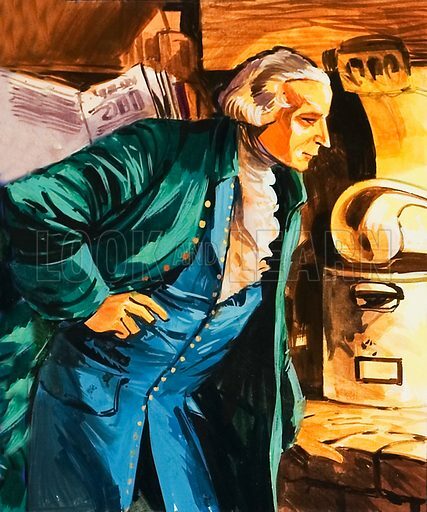 He came under suspicion when the revolution broke out, and in 1792 he was relieved of his office. He continued his private experiments, however, until he was arrested and brought to trial – for serving his country too well. This edited article about Maria Theresa originally appeared in Look and Learn issue number 800 published on 14th May 1977. When The Holy Roman Emperor, Charles VI, died in 1740, he had no son to succeed him. It was his wish that his daughter, Maria Theresa, should assume power on his death but his kingdom was widespread and weak and those countries who had pledged support for Maria Theresa soon realised that they could turn the situation to their own advantage. The king of its mighty neighbour, Frederick the Great of Prussia, marched into Silesia, a province of Austria, and took it over. France and Bavaria declared war, and Charles Albert of Bavaria was elected as the new Holy Roman Emperor. Maria Theresa, who was born on 13th May, 1717, was a beautiful young woman of strong and noble character: she could not give up her inheritance. She appealed eloquently to her Hungarian subjects and won them over to her side. When her enemies attacked, she hit back and clung on, and fortune favoured her. The new Emperor died and Maria Theresa’s husband Francis of Lorraine, whom she married in 1736, was elected in his place as Francis I. A peace was patched up in 1748 with the Treaty of Aix-la-Chapelle, by which Maria Theresa was accepted as ruler of the lands of her father – the duchy of Austria, and the kingdoms of Hungary and Bohemia. With the raw materials of power in her hands, the young Empress began to build up her Empire, which had been stricken by war and poor government. She reformed the army and the administration of the many lands under her rule. She encouraged trade and a wider measure of religious tolerance. She set herself to raise the living standards of her people, and to this end introduced industrial, agricultural and medical reforms. 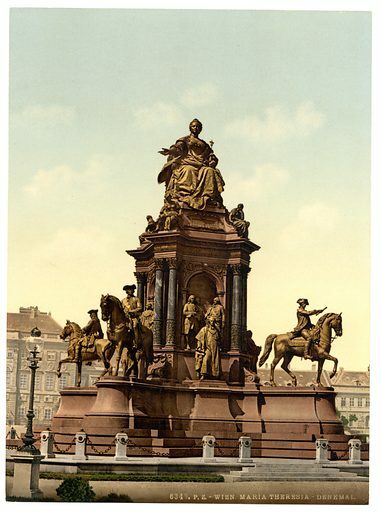 But war was not over for Maria Theresa – it could not be, with Frederick of Prussia as a neighbour. But although circumstances made her a warrior queen, she still strove for the peace which would make her empire prosperous. Her last political victory was the signing of the Peace of Teschen in 1779, by which her diplomacy averted another terrible struggle with Prussia. Maria Theresa was now seriously ill, but after this success she felt that she could face death calmly. She died on 29th November, 1780. The Empress was survived by 11 of her 16 children, one of whom was Marie Antoinette. This edited article about the Boxer Rebellion originally appeared in Look and Learn issue number 800 published on 14th May 1977. Multitudes in the great land of China were gazing in fear and trembling at the eclipse of the sun. Clearly it foretold some dreadful calamity, said the soothsayers. And it was only a matter of time before their prophecies began to come true. This occurred when friction between the fanatical Chinese nationalists, known as the Boxers, and the “foreign devils” they hated and wanted to drive out of their country, flared into open warfare. As the Boxer threat grew throughout the first six months of the year 1900, more and more of the foreign residents in China, most of them merchants or missionaries, sought refuge in the eleven foreign legations in the Chinese capital city of Peking. 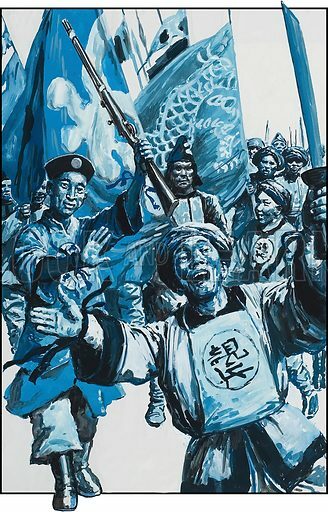 Something had to be done to protect the people in the legations, and on May 31st, 1900, an international force of sailors and marines arrived in Peking from a mixed fleet of 17 warships lying off the mouth of the Pei-ho, the river on which Peking stands. They travelled up the river by boat as far as the important rail and water transport town of Tientsin, and they went the rest of the way by train. At eight o’clock that evening, when they paraded along Legation Street with fixed bayonets, the occupants of the legation buildings, watching them pass, suddenly felt a lot better. But the presence of foreign troops only increased the tension and the possibility of a major clash. The Boxers were out for blood. Refugees, most of them missionaries, were still arriving in Peking with horrifying stories of Boxer atrocities. But, ironically, the flashpoint as far as the foreigners were concerned was relatively trivial – the Boxers’ burning of the grandstand on the private British racecourse outside the city. How dare they! This “outrage” brought things to a head as nothing else could have done, with the result that in the second week of June an international expedition set out from Tientsin to relieve the pressure on the legations in Peking and teach the “unsporting” Boxers a jolly good lesson. 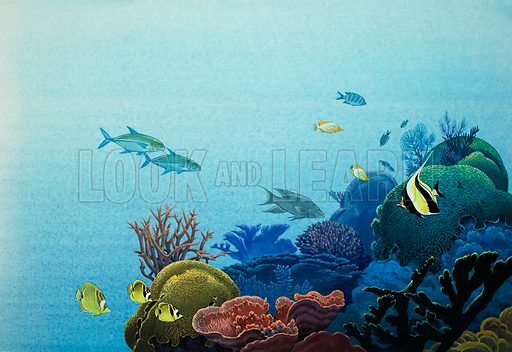 This edited article about marine science and exploration originally appeared in Look and Learn issue number 800 published on 14th May 1977. One day last February, a freighter left the Oregon harbour of Portland and nosed quietly into the deep ravine of the Columbia River on the first lap of the greatest treasure hunt of all time. The German officers, Spanish crewmen and American mining experts aboard the 545-ton Deep Sea Miner II were not dreaming of golden doubloons and jewels cascading from some ancient chest lodged in the sunken wreckage of a long-forgotten galleon. They were on the trail of the natural trove of the deep – King Neptune’s very own treasure that is worth untold millions to the men who can pluck it off the sea-bed beneath the oceans of the world. There, miles beneath the waves in the wandering abysses of the sea-bed lie strange, briquette-like lumps known as nodules, impregnated with precious ores sought by every nation in the world. Set in these nodules, which range in size from potatoes to footballs, is manganese – the mineral that toughens steel – and copper, nickel, cobalt and 30 other metals. The South Pacific alone is estimated to contain as much as 1.5 million tons of nodules, and so at roughly £150 a ton, the potential economic boom from developing this single region enters the realm of the unimaginable. United States defence experts have even come up with some equally staggering figures that confirm the existence of a veritable Eldorado of the Deep. They reckon that the Pacific can provide enough copper for 1,100 years, enough nickel for 23,500 years, enough manganese for 34,800 years and enough cobalt for 260,000 years. And, strangely enough, every year more and more nodules are being thrown up by mysterious convulsions and volcanic eruptions in the inky depths. Some 55,000 tons of copper are added annually to the Pacific Ocean floor. Yet how can these nodules be gathered from such vast depths? Officials of Deepsea Ventures Incorporated, the combine behind the voyage of the Deep Sea Miner II, believe they have the answer. This edited article about the Ironclads originally appeared in Look and Learn issue number 800 published on 14th May 1977. “Build us a ship of iron!” “It cannot be done! It is contrary to the will of God for iron to float.” Thus said the scoffers in all religious sincerity and scientific ignorance. Everyone knew that wood floated and iron sank. Therefore it was common sense to build ships of wood and not of iron. That was what most people thought about iron ships in the 18th century – if they though about them at all. But whether iron floated or not, iron ships were inevitable. They had to happen. The traditional oak forests of England were vanishing. Only the best oak trees were of any use to the ship-building industry which needed a thousand prime trees to build one 700-ton warship or a merchantman. In a survey of the royal forests in 1608, James the First was told that there were 200,000 trees suitable for building naval ships. By 1783 there remained a quarter of that number. Shipbuilders, who were mainly in the south of England where the oak forests had been thickest, were forced to travel the length of the kingdom in search of timber. The desperate shortage of oak forced the builders to look for alternative materials. 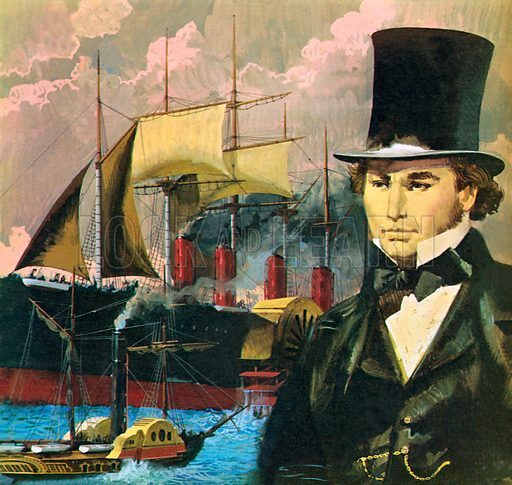 Gabriel Snodgrass, chief surveyor of the East India Company, began using iron brackets in the construction of the company’s fine merchantmen, but it was left to an iron-master of the north to make iron float. He was John Wilkinson, more commonly known as Iron Mad Wilkinson. He had many iron mills in Shropshire and the north, together with ships, farms, alehouses and brickyards. This edited article about Russian legends originally appeared in Look and Learn issue number 800 published on 14th May 1977. Could any champion, however strong, lift the whole weight of the earth? “If anybody can, I am that person,” thought Svyatogor, who was a bogatyr – or “elder valiant champion” – of the ancient Russian people. Svyatogor is supposed to have been so strong that the legends say his muscles weighed him down. But he was proud and declared that if he could find a place where all the weight of the earth was concentrated, he would lift it. His searches took him to a treeless plain, called a “steppe,” where he found a small bag. When he poked it with his staff, it did not move. Neither did it budge when he touched it with his finger. Reaching down from the saddle of his horse, he grasped the bag in his hand, but could not lift it. He dismounted and took hold of the bag with both hands. With a great struggle, he lifted it as high as his knees. However, Svyatogor was not as successful as he thought, for the bag had not risen. Instead, he had sunk knee deep into the earth; and lie was stuck there firmly. Svyatogor, had indeed found the weight of the earth, but God punished him for his pride. At the time when this story was told, the people had adopted Christianity. But their ancient legends of pagan gods and goddesses were still enjoyed. Sailors were also mindful of the power of gods, for the sea was ruled by a Tsar or emperor. This edited article about Alexander Graham Bell originally appeared in Look and Learn issue number 799 published on 7th May 1977. “Mr. Watson, come here: I want you.” These were the first words spoken by the human voice to be heard over a wire. 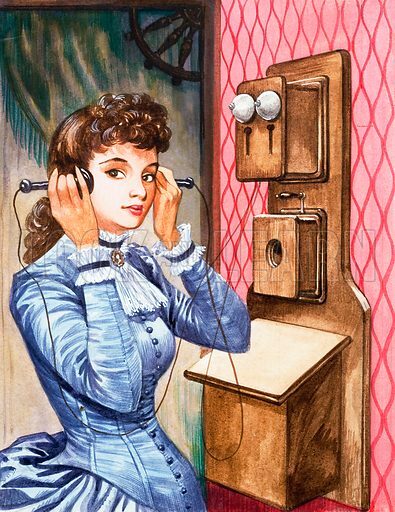 In these days of jet planes, television and communication satellites, it is not easy to recapture the wonder of that moment when the voice of Alexander Graham Bell was heard by his assistant at the other end of a wire on the night of March 10, 1876. The telegraph had been in use for about forty years, and though a marvel of its day, was easily explained. Intermittent currents sent along a wire were used to spell out the letters of the alphabet. Even when, in 1858, the “wire” – an undersea electric cable – spanned the Atlantic Ocean, enabling Queen Victoria and the American President to exchange messages of greeting before the flood of business telegrams began, it was only an extension of the same idea. That the human voice could ever be sent by the same means was such a fantastic thought that few people ever regarded it as being within the bounds of possibility. And those who did had not the faintest idea how it could be achieved. Why, then, was Alexander Graham Bell the first man to break that sound barrier? Because he had the finest beginning that any man could have in that particular realm. He was the son of a man who had been closely concerned with human speech. His father wrote a book called Visible Speech, instructing deaf mutes in lip reading. They fitted up bits and pieces inside a human skull, imitating the human tongue and throat, and using bellows for lungs. Did it speak? It squawked “Mamma” well enough for the woman in the flat below to call up the stairs. “Why can’t you keep that baby quiet?” but young Bell was not deceived about his success. Their “little man,” as they called the robot, “has no muscles and he can’t open and close his throat, or touch his teeth or the roof of his mouth with his tongue, or puff out his cheeks or press his lips together.” Oh yes, Graham Bell knew enough about the wonder of the human voice to realize how far he failed to imitate it. Yet he could not escape from the subject. At the age of twenty-one he came to London, and read a translation of a book by a German named Hemholz describing how scientists had made tuning forks vibrate by electro magnets and imitate the human voice. Was this the way?